H.S.H. 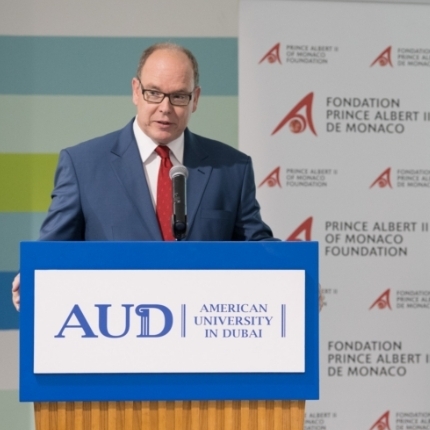 Prince Albert II visited the Emirate of Dubai on 27 and 28 November 2018. 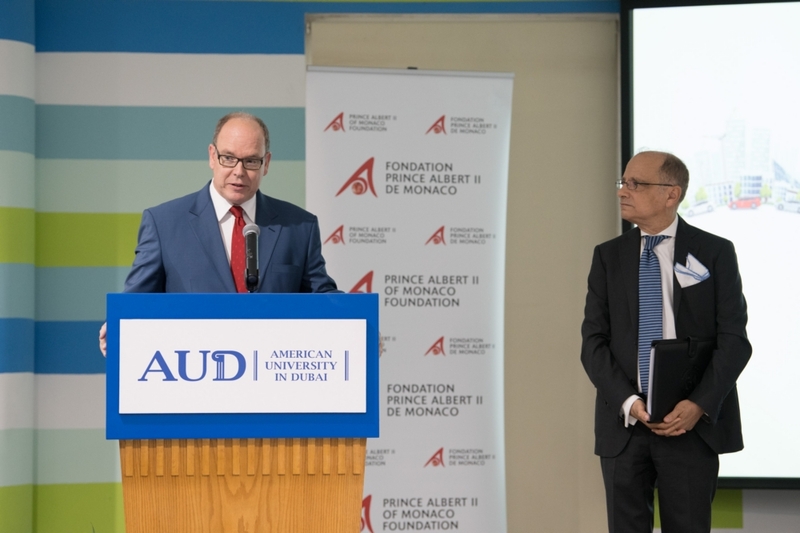 On Tuesday 27 November, Prince Albert II of Monaco delivered the opening speech at the Conference co-organised by His Foundation and the American University of Dubai on the theme of Clean Mobility and Renewable Energy. Several Monegasque personalities spoke at this round table, including HE Bernard Fautrier, Vice President and Managing Director of the Prince Albert II Foundation, Pierfranck Pelacchi, Marketing Manager of the Monegasque Electricity and Gas Company (SMEG), and Gildo Pallanca Pastor, Consul General of Monaco in New York and owner of Venturi Automobiles. In His speech, HSH the Prince recalled His personal commitment to environmental issues for over 25 years, the actions He has undertaken through His Foundation for over 10 years and His Government’s commitment to implementing sustainable solutions to promote the Energy Transition, Sustainable Mobility and the promotion of Renewable Energy. In the evening, the Sovereign Prince participated in a gala dinner presenting His Foundation’s actions all over the world. To open the soiree, the Monaco Inter Expo (MIE) team, led by HE Mireille Pettiti, Chair of the MIE Board of Directors, and Albert Croesi, Managing Director of MIE and General Commissioner of the Monaco Pavilion, gave a private presentation of the Principality’s participation in the Dubai World Expo 2020. A video evoking the spirit of the ‘Monaco 360, a World of Opportunity’ Pavilion was screened. During this visit, the Monaco Economic Board organised, from 26 to 29 November 2018, an economic mission with a delegation of businessmen and businesswomen to enable them to meet their local counterparts. Thus, HSH Prince Albert participated on 28 November in the opening of the economic conference between the Dubai Chamber of Commerce and Industry and the Monaco Economic Board. He witnessed, alongside HE Majid Saif Al Ghurair, President of the Dubai Chamber, the signature of a Memorandum of Understanding between the two economic entities represented respectively by SE Hamad Buamim and Michel Dotta. Later, the Sovereign Prince went to the International Humanitarian City, where was welcomed by Her Excellency Reem bint Ebrahim Al Hashimy, Minister of State for International Cooperation of the Emirate of Dubai, for a presentation of the organisation and infrastructure of this 127,000m² logistics centre dedicated to humanitarian aid. This organisation founded in 2003 by His Highness Sheikh Mohammed bin Rashid Al Maktoum, Vice President and Prime Minister of the United Arab Emirates and Emir of Dubai, brings together 80 members, including 8 United Nations agencies, 20 commercial enterprises and non-profit organisations.